Every book I've read and seasoned military wife I've talked to has told me the same thing: "Everything will break the day after he leaves." I scoffed at such a notion. Sure, something is bound to go wrong along the way, but let’s not get dramatic. Just a few days before my husband, Matt, was set to deploy, a random, unexpected wind storm blew in. 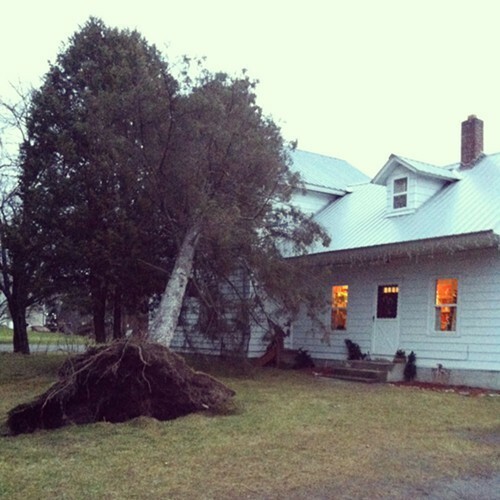 A tree fell on our house. I woke up to a loud crack, a boom and screaming children. Yep. A tree. On our house. I was thankful Matt was there in that moment and during the next day, when the tree was being removed. I was left to deal with insurance adjusters and roofers and that pesky hole in the roof. It had begun. And there was no stopping it. On departure day, we all said goodbye at the airport. The boys and I came home and cried and cried. Then Matt texted me, "Flight is canceled. Come get me." Of course it is. The deployment-makes-everything-break curse was strong enough to simultaneously crack the door of the plane and summon a massive snow storm. Matt left for good a few days later. I ended up thanking the curse for giving us that extra time together. I sent it an offering of wine and chocolate, and swore I'd never doubt its ability again. Day one. It goes off without a hitch. It’s our 14th wedding anniversary, but my thoughtful husband sends me flowers and a touching card. I enjoy the day despite the growing loneliness in my heart. The kids are well behaved. Nothing breaks. The curse is broken! We eat chili dogs and French fries and drink root-beer floats in celebration of a good day. Day two. I get the kids on the bus. I'm excited to get all the grocery shopping and errands done. Christmas break has left me yearning for a productive day without three little helpers. I have a box ready to ship to my love. Yes, he just left, but it takes days to receive mail overseas. This will arrive in perfect timing. I try to start my van with my remote car starter. We live in Vermont and we do not have a garage — I kiss my car starter every morning. This time, the engine doesn’t turn. Strange. I kiss the car starter again and pray for the magic to happen. Turns out, even a desperate kiss can't warm up the frozen heart of a vehicle when it is -10°F. I trek out to the van to try to start it myself. Click. Click. Click. Nothing. It's too cold, I decide. It just needs a jump. Easy fix! You won't get me today, curse! I walk up and down the street to find a neighbor to give me a jump. We live on a sparse, dead-end road. No one is home. My neighbors are always home. Not today, of course. I Instagram a picture of my plight (because that's the natural thing to do when in distress) and a friend hears my cry for help. He finds that not only is my battery dead, it's like ... dead-dead. 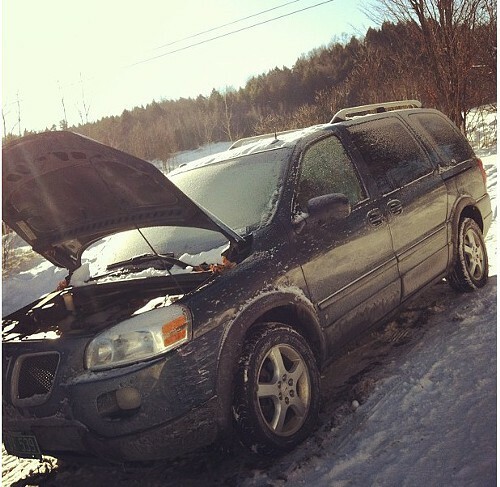 Long story short, several frozen fingers and the cost of a new battery later, my van is running again. The kids will be home in a few minutes. There goes day two. And the perfect timing on shipping that box. I'd like to say I got my fill of the curse and it went happily on its way. But I'm afraid it's here to stay. The "broken" list continues to grow. I'm not sure if things are really breaking more often than usual or if I'm just noticing it more since my in-house handy man is out of town. Everyone I know tells me I'm growing in strength with each passing, broken day. I think they're right. I'm learning a few things along the way. I've learned that crying to your insurance adjuster gets things covered that shouldn't be. I've learned that Instagram pictures move people to action. (Ha!) I've learned a whole lot about furnaces and how they work — and don't work. Mostly, I've learned that I am surrounded by the most amazing family and friends. I receive at least three phone calls a day. People checking in on me. Friends offering a helping hand. Family encouraging me with kind words. I've learned that things can break all day long, but it doesn't mean a darn thing about the quality of my life. I've made friends with the curse. We're buddies now. It shows me what I'm really made of and I show it how much I like ice cream. I won't be sad to see it go when Matt returns and everything is magically made of the strongest, most unbreakable materials again. Until then, I hope I'm the one who is magically strong and unbreakable.